My contacts in Venezuela tell me that merely posting the black market exchange rate of bolivars to USD can get you arrested. So yes, Venezuela’s regime has gone full Orwell-1984: whatever is true is outlawed. 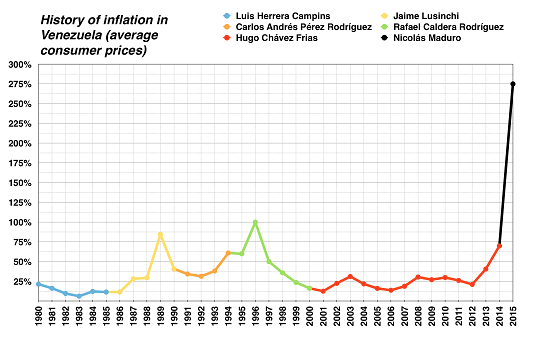 Venezuela is imploding not because of hyper-inflation, but as a result of policies that led to hyper-inflation: policies that generate perverse incentives, disincentives to produce goods and services and incentives to depend on government subsidies. But one of my correspondents nailed a key cause that is rarely discussed: Venezuela has been effectively de-industrialized. Capital that should have been invested in the electrical grid and the oil industry has been diverted to other pet projects (and the pockets of regime insiders). There’s no food in the markets because government-set prices don’t make it worthwhile to grow anything. Farmers take their produce to neighboring countries if they can, where they can actually get paid for producing food. But de-industrialization is the result of more than perverse policies. 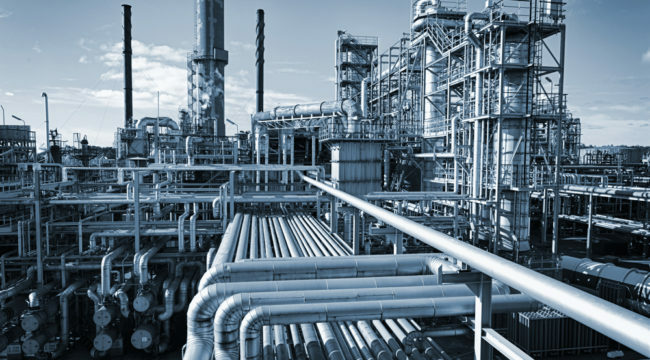 De-industrialization results when a citizenry is denied access to the tools and capital needed to produce goods, and when government subsidies sap the will to take the risks that are part and parcel of making real stuff. De-industrialization is also the result of currency exchange and trade policy. When it becomes cheaper to import goods and services from other nations, the domestic populace loses the will and the skills needed to produce goods and services. But a funny thing happens when a nation loses its capacity to produce real goods in the real world: when the currency and trade policies that made importing everything financially sensible blow up, there’s nobody left to actually make essential goods, grow food or maintain critical infrastructure. De-industrialization is a gradual process. The loss of key industries is gradual; the loss of supply chains is gradual; the loss of local suppliers and jobbers is gradual; the loss of skilled workers is gradual; the decline of local capital is gradual; the loss of the willingness to get out there and take risks to make real goods in the real world is gradual. 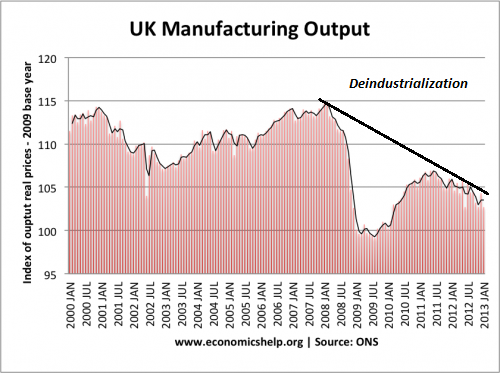 This is a chart of industrial production in the United Kingdom. many nations share the same basic trajectory: given a strong currency and restrictive policies, it no longer makes sense to produce goods, food, transport, etc. Financialization and free-spending governments borrowing billions create the illusion that a nation that was once a nation of makers can become a nation of takers with no downside. Once a nation no longer produces essential goods and services, and depends on financial games or commodities to pay for industrial goods and food produced elsewhere, it becomes vulnerable to a collapse in the financial games and the commodity markets that made it all too easy to succumb to de-industrialization.